It was not immediately clear why the Sewol ferry listed heavily on to its side and capsized in apparently calm conditions. Most of the passengers on board the ferry appeared to have been teenagers and their teachers from a high school near Seoul. Nearly 280 people, many of them students from the same high school, were missing after a ferry capsized off South Korea on Wednesday, in what could be the country’s biggest maritime disaster in over 20 years. The ferry was carrying 462 people, of whom 179 have been rescued, coastguard officials said. Six people were confirmed dead, but as frantic rescue operations continued late into the night under light from flares, hopes were fading for the 277 unaccounted for. It was not immediately clear why the Sewol ferry listed heavily on to its side and capsized in apparently calm conditions off South Korea’s southwest coast. “It was fine. Then the ship went ‘boom’ and there was a noise of cargo falling,” said Cha Eun-ok, who was on the deck of the ferry taking photographs at the time. “The on-board announcement told people to stay put … people who stayed are trapped,” she said in Jindo, the nearest town to the scene of the accident. Most of the passengers on board the ferry appeared to have been teenagers and their teachers from a high school near Seoul who were on a field trip to Jeju island, about 100 km south of the Korean peninsula. The ferry began to list badly about 20 km off the southwest coast as it headed for Jeju. Several survivors spoke of hearing a “loud impact” before the ship started listing and rolling on its side. Within a couple of hours, the Sewol was lying on its port side. Soon after, it had completely turned over, with only the forward part of its white and blue hull showing above the water. Coastguard vessels and private fishing boats scrambled to the rescue. 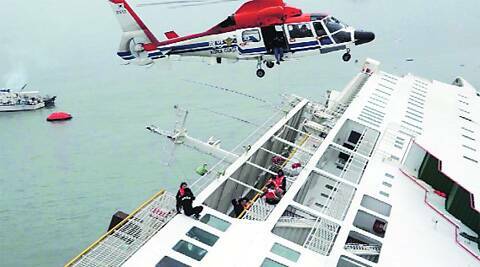 Other passengers were winched to safety by helicopters. The ferry left from the port of Incheon late on Tuesday. It sent a distress signal early on Wednesday, the coastguard said, triggering a rescue operation that involved almost 100 coastguard and navy vessels and fishing boats, as well as 18 helicopters. An official said the waters where the ferry capsized have some of the strongest tides of any off South Korea’s coast, meaning divers were prevented from entering the mostly submerged ship for several hours.